Imagine a quiet log cabin set in the middle of the Smoky Mountain woods. See the tall trees, lush greenery, and a peaceful rolling creek beneath the quaint wooden bridge in your front yard. All this and more can be yours when you book your stay at Creekside Manor, a newly rebuilt cabin for 10 nestled in the heart of the Great Smoky Mountains! Bring your family or a group of friends to enjoy the relaxed ambiance this quiet cabin affords. 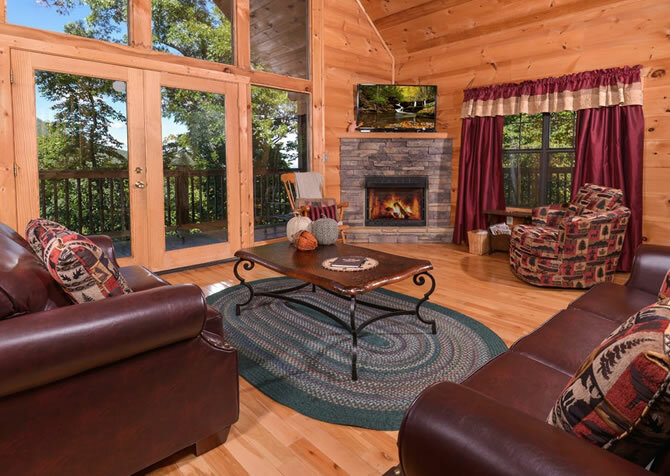 Located less than 5 miles from the thrills of downtown Gatlinburg in Chalet Village, Creekside Manor comes with an impressive list of amenities, from flatscreen TVs and game systems to an outdoor hot tub and community pool access! So pack your bags and get ready for an unforgettable getaway at Creekside Manor! When you enter Creekside Manor, you’ll immediately appreciate the coziness offered by this Gatlinburg cabin. With a convenient mud room just off the front door, feel free to put your, coats, hats, scarves, shoes, and what have you away before entering the main cabin space. 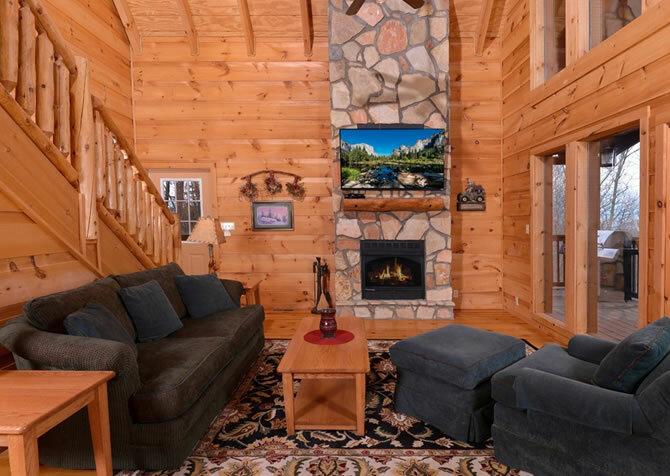 The living room features tall ceilings and gorgeous hardwood floors, and the stunning focal point is a large stone-set, gas fireplace — the perfect place to warm up on chilly Smoky Mountain evenings. Enjoy a peaceful night in front of the crackling fire with your favorite show on the flatscreen TV or a comfortable afternoon on the couch exchanging stories from your downtown adventures. Harboring a chocolate-colored, suede sofa and matching love seat — complete with plush throw pillows — and an impressive (to say the least) ceiling fan, this living space keeps everyone in genuine comfort. 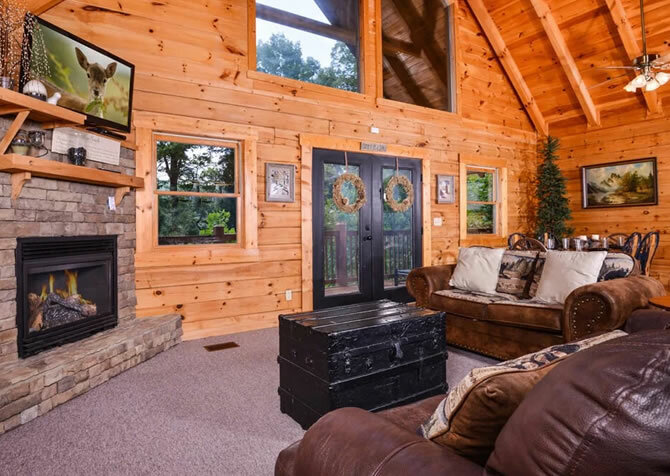 And to top it all off, the back wall of the living room is covered from floor to ceiling with large windows, offering amazing views of the Smoky Mountain trees right from the comfort of your cabin! Watch as birds fly by, clouds pass, and the colors of the forest change with the sun’s path throughout the day. There are tons of delicious, must-try foods in the Gatlinburg area — from buttermilk pancakes to old-fashioned taffy. We hope you’ll make time to visit local restaurants and enjoy all the varieties of flavors the Smoky Mountains provide. But if you’re looking for a great way to save a little money and enjoy some time with the family, plan for some in-cabin meals as well. Casseroles, soups, and sandwiches are easy options for your Gatlinburg getaway. All you need is a visit to the Gatlinburg Farmers Market or a local grocery store, and you’re on your way to a delicious, cabin-cooked meal at Creekside Manor! Fully equipped, the kitchen in this cabin comes with everything you need for your famous recipes. Black-and-stainless-steel appliances — including an oven/stove, refrigerator, microwave, and dishwasher — will all be available to you, as well as a toaster, knife set, double sink, and coffeemaker. Don’t worry about cups, plates, or utensils either — at Creekside Manor, we’ve got you covered! Please enjoy making all your favorite recipes in this cozy kitchen during your stay. When the casserole is out of the oven and it’s time to eat, head on over to the dining area of Creekside Manor. In this open space, you’ll find a metal-and-barnwood-style rustic table with 6 red metal chairs. If you need more seating than this table provides, no problem! Creekside Manor also has a breakfast bar attached to the kitchen, which is conveniently located close to the dining table. This bar comes with 4 industrial-style stools and can double as a space for extra guests or kids to sit as well as extra serving space during mealtime. Arrange your dishes in a buffet line, and then stroll over to the table for a quiet meal with the family. One of the best features of the dining area in Creekside Manor is the large, double-paned window that offers views of the forest while you eat. Although Gatlinburg has some amazing food to offer you, you won’t find the same kinds of views in downtown restaurants that you’ll get at Creekside Manor! When you feel the urge to get away and possibly beat some bad guys, head to the game loft, where yet another flatscreen TV awaits along with a retro SEGA gaming system — packed with no less than 80 built-in games! Be the hero of your own story and show the villains who’s boss or challenge your bestie to a few friendly (or competitive) rounds before bed, all from the comfort of a large sofa with a cool barrel design. If video games aren’t really your thing, go for one of the classic board games provided instead. Not up for games but want to hang? Take a hint from the decorative suitcase nearby and go for a mixed drink instead. And be sure to take in the majestic forest views through the floor-to-ceiling windows in the living room while you’re there. Who knows? You may just spot something photo worthy, like a meandering bear, foraging fox, or grazing deer. After spending the day at the Great Smoky Arts & Crafts Community or riding the slopes at Ober Gatlinburg, you’re going to want a comfortable place to crash. 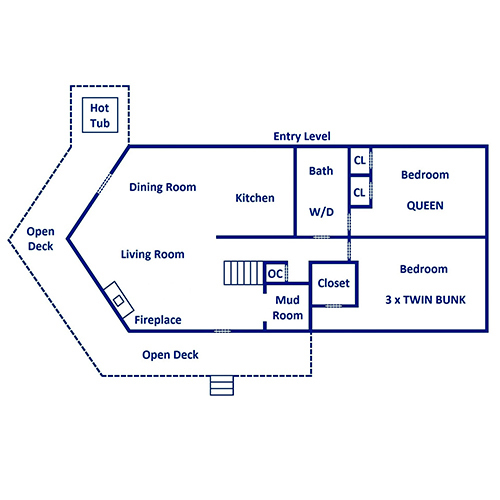 At Creekside Manor, your crew will have multiple options for sleeping with the 3 bedrooms in the cabin. 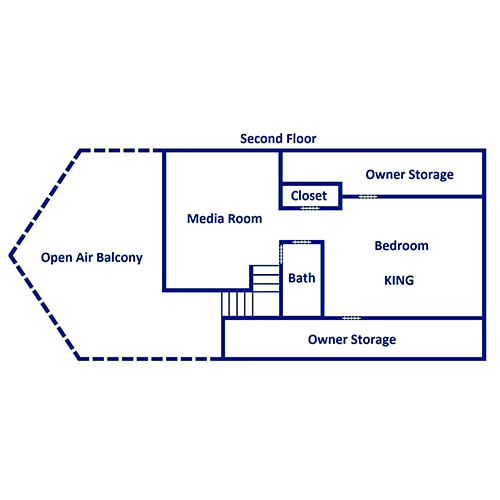 The upstairs bedroom comes with a king-size bed and an en-suite bathroom, and one of the entry-level bedrooms comes with a queen-size bed. Both bedrooms offer side tables, reading lamps, bureaus, and flatscreen TVs, as well as windows with blinds for privacy. The last bedroom on the entry level has 3 twin bunk beds and a mounted flatscreen TV along with a DVD player, creating a dream space for the kids. In total, you’ll be able to accommodate 10 guests comfortably in the bedrooms and other sleeping spaces provided by Creekside Manor. And the 2 full-size bathrooms found in this cabin should provide enough space for everyone to get ready in the mornings for your big adventures downtown! If you’re booking your stay at Creekside Manor, chances are you appreciate the outdoors. The peaceful setting surrounding this cabin — from the lush forest grounds to the rolling creek at the base of this property — are selling points for anyone looking for a quiet getaway near Gatlinburg. And to really soak in the ambiance of this cabin, you should head to its versatile outdoor spaces. The large deck of Creekside Manor comes with a soothing outdoor hot tub and multiple seating options, including cushioned rocking chairs, a couple’s bench with a connected table, and a spool table with chairs. Sip wine with tree-studded views and unwind every evening in the bubbly hot tub. There’s also flat, paved, motorcycle-friendly parking for 2-3 vehicles, which includes room for a trailer, and 0 steps to enter the cabin. Simply park your car, grab your suitcases, and cross the picturesque wooden bridge straight out of a fairytale to enter the home and start your Smoky Mountain vacation with ease! Wondering how to keep up with the laundry during your Gatlinburg vacation? Creekside Manor comes with its own washer and dryer for its guests to use while they’re away. Need to keep up with emails or upcoming local events? Free high-speed wireless internet is yours for the taking! There’s even a Blu-ray player for your favorite films and TV series. And these are just a few of the extra amenities offered by this cabin. As part of Chalet Village Resort, Creekside Manor provides complimentary access to tennis and basketball courts, a clubhouse, workout room, and more. 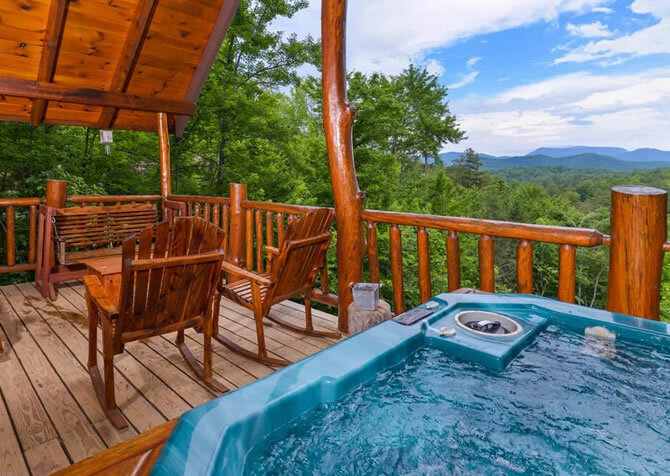 Even better, this cabin offers community pool access — something you’re sure to appreciate during the summer months in the Smokies! Challenge yourself at Ripley’s Mirror Maze on the Parkway in Gatlinburg. With surprising corners and dead ends, your family will have a great time working together to find your way out! A visit to America’s most visited National Park is a must-do on your Gatlinburg vacation. This park is free to all guests and has something for the whole family, from hikes and picnics to horseback riding. To see the rodeo in action, head over to Dolly Parton’s Stampede! Enjoy a delicious Southern-style meal and live rodeo entertainment at this family-friendly attraction 5.5 miles from Creekside Manor. "I have rented cabins through Cabins for You twice now and can't say enough good things! Friendly staff, quick booking process, and cabins were extremely extremely clean. Can't wait to go back!" "This is a picture perfect cabin in the woods right outside downtown Gatlinburg. It has everything you need and more. There is plenty to eat downtown, especially flapjacks, but the kitchen was perfect so we had breakfast and dinner at home every night! This is an amazing getaway, you will enjoy every minute of it! It was even better than we expected! (And we already expected it to be perfect). We both brought some extra towels and toilet paper just in case and we were so pleasantly surprised by the extra towels and pillows on the bed! It was such a fabulous cabin with everything we needed and more. Only wish we could have stayed longer to enjoy everything even more! We cleaned up and wiped down with some multi use cleaner we packed just to make sure it was just as clean as when we got there, and swiped up the floor with the very handy broom :-) the washer was so great, we have no dirty laundry coming home! we even had some beary cute visitors on Thursday morning :-D (they may be seen on the ring doorbell cam, they were very polite bears haha). The location was perfect and the kitchen, bedrooms, hot tub, and showers were absolutely amazing. I really can't gush enough about how perfect the cabin was! Thank you so much for letting us stay for the week! We will definitely be back next year (close to the same time maybe a little later if my husband finishes his military training in time for a fall getaway) and if this cabin is available we are most certainly going to rent it again!!!" "Gorgeous cabin, amazing view. Was just an awesome experience. Thank y’all for letting us stay!" "Their customer service is amazing! Didn’t have to wait long for help from an actual person, not a computer."